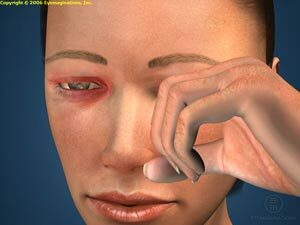 Blepharitis is the most common inflammation of the eyelids. It may be asymptomatic or can cause irritation, burning, and redness of the lids or conjunctiva. Each person has bacteria present on the surface of their skin and most people will never be bothered by it. This same bacteria on certain individuals tends to thrive at the base of the eyelashes. Irritation may result from the overactivity of the nearby oil glands causing scales and particles to form along the lashes and eyelid margins. The effects of blepharitis is different for each person. Some people are affected with only minor irritation and itching from the scales or bacteria, but others may be affected with redness and/or a burning sensation. An allergic response to the scales or bacteria that surround them may develop. Using a warm, moist washcloth, place it over the closed eyelids for minute at least twice a day. It may be necessary to remoisten it as it cools down. This will be helpful to soften and loosen scales and other particles on the eyelids. This treatment also helps to prevent the development of a chalazion, which is an inflamed lump within an eyelid oil gland. It is important to gently rub the base of the lashes about 15 seconds per lid with a mild baby shampoo using a cloth-covered finger, cotton swab, or commercial lint-free pad. If your doctor has prescribed an antibiotic ointment, apply a small amount at the base of the lashes using a cotton swab or fingertip. This is generally done at bedtime. Artificial tears may be helpful to relieve dry eye symptoms. These eye drops are available without a prescription. REMEMBER: To control blepharitis, it is necessary for the patient to actively cleanse the lashes daily and apply warm compresses as described and remembering that medications alone are not adequate.